Matchbox is a free software (GPL v2+) window manager for the X Window System designed for embedded systems. It's latest stable release was in April of 2012, the same year this phone was known to be released in the UK. It's rather lightweight, displaying only one window at a time, and has its own software keyboard built in, making it the interface I recommend the most for this device. MATE is a fork of Gnome2 fork in response to the negative reception of Gnome3. It's initial release was in 2011 (GPLv2, LGPLv2) and it's still in active development. It doesn't come with a software keyboard and it can be slow and buggy at times. It feels more appropriate as a desktop interface. Xfce aims to be fast and lightweight, while still being visually appealing. It follows the Unix philosophy, with each component being its own project. It's latest stable release 2015, licensed under the GPL, LGPL and BSD licenses. It doesn't come with a software keyboard. I would recommend it about as much as I recommend MATE. i3wm is a tiling window manager for the X Window System. It's rather small and lightweight. It's initial release was in 2009 and is still in active development. It's licensed under the BSD license. It's highly keyboard driven, but doesn't come with a software keyboard. I would recommend this interface for users who own a hardware keyboard. Weston is a demo Wayland compositor. While it runs nicely on this phone, it has very limited functionality. I personally wouldn't recommend it for everyday use. Plasma Mobile is a GPLv2 licensed smartphone interface. It's sadly painfully slow on this phone and rather buggy. I wouldn't recommend it. Hildon is an LGPL user interface for cell phones. It sadly doesn't work on this device at the moment. Before installing, ensure that your host computer and your copy of pmbootstrap is fully up to date and that your system has been rebooted since it was last updated. 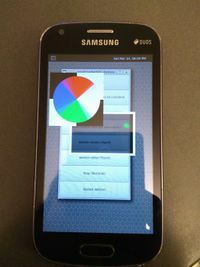 Select "samsung-kylessopen" as the target device and select a working recommended graphical interface. See notes regarding full disk encryption. If you can't get SSH over USB to work, see USB_Network. The screen flickers, flashes and scrolls except for when a desktop environment is running. This makes it difficult to tell if FDE is even working properly. For now, it's unusable. The device charges successfully, but charging-sdl doesn't launch, with "error starting charging-sdl". Check out troubleshooting page. Mainlining is an important task for this device, because kernels and drivers that supposedly work for this device are scattered across various git repositories, usually forks of other projects, often heavily patched and abandoned. Relying on kernels that can have their repos deleted at any moment, that are often heavily fractured anyways probably isn't a good idea. This page was last edited on 25 March 2019, at 03:58.